Taking your car to a body shop to repair deep paint scratches can cost anywhere from $500 – $1,000. Many people don’t know that this expensive repair can be done at home with very little time and money. With the right tools and a good amount of patience, your car will look like nothing ever happened. Learn exact repair techniques professionals at the body shop use to repair deep scratches. There is no good reason to pay someone hundreds of dollars of your hard-earned money to repair these scratches when you can do it yourself for a fraction of the cost. In this post, I will tell you how to fix deep car scratches for only $50. First, determine how deep the scratch is. The scratch on the photo damaged the clear coat, paint layers and some primer, but didn’t damage the metal. This scratch can be easily fixed in just a few hours and for only $50. No experience needed. I recommend fixing all the scratches as soon as you can to avoid rust development. Here are the products I recommend using for this repair. Since I am just linking to the web sites that sell these products, the prices could change in the future, but you should still be able to stay within $50. Assorted Wet/Dry Sandpaper – $4.95 – This pack includes 5 sheets of assorted sandpaper (1 sheet each of 180, 320, 600, 1000, and 1500) and can be used for sanding primer, clear coats, and automotive paints. Buying assorted pack is a great way to save money. If you buy each grit separately, it will cost you about $35 for all of them. Primer – $7.95 – 12 oz. aerosol acrylic lacquer primer that can be used over areas like bare plastic, metal, and spot putty. This easy to sand primer will help you create a uniform surface and fill in sand scratches. Touch Up Paint – $19.95 – 12 oz. custom aerosol spray paint matching your car. This paint is high quality and is easy to apply. Clear Coat – $7.95 – 12 oz. aerosol spray can. Meguiar’s Ultimate Compound – $8.97 – You can use any rubbing compound you like, just make sure it is clear coat safe. In my opinion, Meguiar’s Ultimate Compound is one of the best car scratch remover on today’s market. It removes light-to-deep clear coat scratches, swirl marks, stains, and heavy oxidation in just few minutes. It’s clear coat safe and inexpensive. It is formulated to level imperfections and leave a smooth finish. You can use it by hand of with a polishing machine. Aerosol Spray Trigger – I put this item under optional items, however I think it is a must-have when it comes to spray painting. It turns a spray aerosol can into a spray gun making it easier to apply the paint and the clear coat. Meguiar’s Ultimate Polish – Use your favorite polishing compound. I like Meguiar’s Ultimate Polish because it uses diminishing abrasive technology, meaning the tiny abrasives break down gradually as you rub. This polish will give your car “wet look” you see in the show rooms. It is high quality, inexpensive, long lasting, and clear coat safe. Meguiar’s Tech Wax – Use your favorite wax. I like Meguiar’s NXT Generation Tech Wax. This extremely durable, long lasting wax will make paint color look bolder and brighter with a smooth, sleek shine. It protects against UV damage, and eliminates fine scratches and swirls, providing a tough polymer bond for durable protection. All of the above products are very inexpensive, but high quality. Although the goal is to save money, lower quality products might compromise the final result. Start by locating your car’s paint code. It might be on the side of the door jamb, glove box, or trunk. Sometimes it is hard to find. 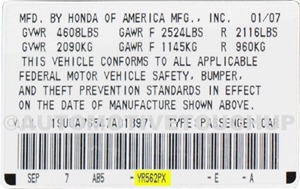 Here is a sample label that can be found on Honda. There are a lot of numbers on the label and it might be difficult to figure out which one is the color code. The paint color code for this car is YR562PX. If you feel confused about color codes, you can just go to the site that sales auto paint and find your color code by selecting make, model and the year of your car. Even if the site displays a few blue color codes, it will be easier for you to compare it to the label and see if one of the codes is there. After you’ve found the code, it is time to order a touch-up paint. Touch-up paint comes in spray can, paint pen, or in a bottle with a brush. Spray painting is the most effective way to repair a deep paint scratch. For small area, you really don’t need a lot of paint, so 12 oz spray can should be more than enough. You can buy it online or at the dealership. If you trying to stay under $50, you should definitely order everything online. Check for rust. If you noticed rust development, use rust remover. Don’t forget to wear gloves when working with chemicals. Apply rust remover and let it penetrate the rust for about 10 min. Rinse off the area with clean water. Next, remove all the dirt around the scratch with warm water and dish soap. Oils, wax, and grease are difficult to remove with water, so follow it with prep solvent. When the area is clean, dry it completely. By the end of this step, you should have a clean surface to work with. Mask the area using auto masking tape and old newspapers to prevent overspray from the primer and the paint. Instead of newspapers you can use a plastic cover. I don’t recommend using duck tape since it can leave residue. While protecting the car from oversparay, you want to make sure you leave enough space fore even blending of the primer and the paint. In the video, you can see how they masked off the whole bumper panel. If you don’t leave enough space, you will get a line that will be hard to remove. Sand the area with 600 grit sandpaper using circular motions. You can do “dry sanding” or “wet sanding”. I personally like wet sanding more because it is faster. But you can do it either way. To wet sand the area, start by soaking sandpaper in cold water for 10 min. Use dishwasher soap to make the surface more slippery. Wash off sandpaper after 4-5 sweeps. Wet sand the area that might get some touch up paint and clear coat with wet/dry 1,500 grit sandpaper. Make sure to use a lot of water. The final result should be a smooth surface without any pumps or scratches. If the surface is not perfectly smooth, all imperfections will multiply when you apply paint. Don’t worry about scratching the paint near the scratch, it will be covered with new paint. Note: Auto sandpaper is not the same as wood sandpaper. Wood sandpaper is too rough and will leave scratches. For wet sanding make sure it says wet/dry on the sandpaper label. After sanding is done, clean the are with prep solvent to get rid of the dust. Spray the prep solvent and wipe it off with clean microfiber cloth. Don’t forget to dry the area before applying primer. Primer will prevent metal from rust and create a uniform surface filling in sand scratches. Also, paint sticks better to primer than metal or plastic. Primer comes in four colors: black, gray, red, and white. The idea is to buy a primer that is closest to your paint color so you will need less paint coats to cover it. Since you are working on a small area, 12 oz. aerosol primer will be enough. Shake the can. Evenly spray the area holding the can about 15-20 inches away from the surface. Apply 3 coats giving each coat about 10 min drying time. If you purchased your primer somewhere else, it might have a different drying time. Make sure to check the label for instructions before applying. Note: Primer covers 180-320 grit sand scratches. In this step you want to smooth out the primer a little. Allow the primer to dry for 30 min before sanding. Start with wet/dry 600 grit sandpaper and follow it with wet/dry 1,000 grit. I would recommend doing a wet sanding instead of dry. It clogs less and sands faster. When you are done with sanding, dry the area. Tip: Wrap sandpaper around a sponge to avoid fingerprints. Now you are ready to paint also called “base coat”. Using a plastic trigger to convert paint can into a spray gun will make the application much easier. Test the touch-up paint first in the hidden spot, to make sure the colors match. Shake the can. Evenly spray the area holding the can 15-20 inches away from the surface. The idea is to blend the new paint with the old one by spraying each coat a little farther from the damaged area. This method is called “feathering”. Apply 3 coats. Give each coat about 10-15 minutes drying time. Wait for 30 minutes before applying clear coat. If you over sprayed the paint, it can be easily removed with rubbing compound later on. So far I think all the steps looked pretty easy and you have only a few steps to finish the job. At the end of these step, the surface might look dull comparing to the rest of the finish. But don’t worry, it will be shiny like the rest of your car after you apply the clear coat. You are almost done. Clear coat is used to protect the car’s paint from UV lights, scratches and chips. Auto paint is very fragile, but applying clear coat makes it stronger. It is also makes the surface more slippery and gives it nice shine. Using plastic trigger on the can will make the application more even. Shake the can well. Apply 3-4 coats leaving 10-15 min drying time for each coat. Each coat should look wet and glossy but not dripping. When the last coat is dry, remove the masking paper. Wait 24 hours before applying rubbing compound. Note: Auto clear coat is different from clear coat for nails. Nail clear coat, also called top coat, is designed to protect nails not a car. It will will last only a few days and than will start chipping off. Rubbing compound is used to add gloss and to remove imperfections from the clear coat. Although rubbing compound is sometime referred to as a “polisher”, rubbing compound and polishing compound are not the same. Both products are designed to remove imperfections from the clear coat, but rubbing compound is more abrasive than polishing. Rubbing compound is also used to remove over spray. Start by reading instructions. Place few drops on the application pad and make few sweeps using circular motion. Remove residue with a clean microfiber cloth. Avoid using paper towels or old t-shorts. They are too rough and might leave ugly scratches on the clear coat. Note: Clear coat overspray, dust or orange peel, can be removed by sanding it with wet/dry 1,500 grit sandpaper. This step is optional. If you want to have showroom shine, use polishing compound. You can apply it by hand or you can use a buffing/polishing machine. I like Meguiar’s Dual Action Polisher because it doesn’t lose speed when pressure is applied, has six speed setting, and won’t leave swirls or holograms on your finish. Apply polish using a clean applicator pad to one section at a time using moderate pressure. Wipe clean with a soft microfiber cloth. Turn the cloth and buff. If you are using a dual action polisher, apply it to one section at a time. Wipe dry with a microfiber cloth and then buff. Wait for 30 days before applying wax. Hope you’ll like this tutorial. Let me know if you have any questions or comments. This was very helpful. Where do I go to purchase these products? forgive my ignorance, in the second photo what is the white outline?? I would like to know does the color of primer matter? *claps hands excitedly! * Thank you ever so very much!!!!! My husband is a super busy man and so I don’t like to bother him with petty complaints, but the scratches on our car really have bothered me for a while. Now I can fix it myself! And for less money than a grocery trip! Hi this was very interesting indeed and that is exactly how I damaged my car. Bt where can I find the product kit around south africa???? Hello, will this work on chipped off paint. I got a super cheap paint job, and the paint is chipping off on the back…can I use this method on my chipped paint. Hi, sorry if this is a silly question but I’ve never done anything like this before and want to make sure I don’t overspray. When you say a “coat” of primer or paint, how long do you spray for to apply that coat? What primer would be better for me, grey, black, or your red, for my 07 acura tl moroccan red? Sort of a maroon. Would the red primer on this website be too bright or shall i be better off with grey? Thanks! Hi Mike, this looks to be a great help and I will be using your advice in the coming weeks (weather permitting!) I was originally quoted around £300-400 for the repair so I will be saving a great deal. Many thanks again fella. Hey mike, nice write up. im half way done fixing my front bumper and I have to say, I would not have gotten anywhere without your work, this is my first time painting and it is turning out pretty well after seeing some other peoples work with “cans”. Hello, thanks for the very helpful website. I’m wondering if this particular tuturial would be applicable to painting a plastic bumper cover exhibiting similar paint scratches but with slight scuff marks on the plastic? Would the process be the same or would there be different steps involved? Hi, firstly let me say thank you and well done for making such a brilliant site, it is just what every car owner needs. I have used the method above and my results look good, however where i have feathered the new paint you can see what looks like slight mottling, what has caused this and how can i resolve it? the centre of the newly painted area is perfect. This is a great website and I know i’ll be trying to learn a few things on here. I’m wondering if these same products would still be helpful for me since I only have small pebble size chips in paint (a lot of them in front bumper area), with some pebble size rust spots (4-5) around the bumper and hood area. I also have paint across the rear bumper that is starting to crack and looks faded (it looks like 4 – 5 circles of fading paint but up close I can see small cracks) but is hard to notice. Thanks for the reply. I’ve ordered the products for a minor touch up so I can at least fix the small spots of rust for now. Thanks for the great tutorial, probably the clearest I have seen on the internet. I have a few questions: When I’m spraying the coloured paint, is it ok to “feather” it onto clear coated areas? Will the paint adhere to existing clear coat? And ion some tutorials, they say you have to sand down the clear coat first with very fine paper before buffing, is this necessary? thanks for the info i have a few deep scratches on my bumpers, i was wondering though will the touch up spot be very noticable compared to the rest of the bumper? Great work here Mike, will give this a go, hoping the products can be bought in the UK. My scratch is very close to a chrome part on my bonnet, just above the grill, so not much room to feather the spraying, any tips? My friend at work had some touchup paint which I used because I thought it would sorta fill the scratch but it didn’t help. Now it looks horrible. I really wanna fix it. What paint and primer would be best for my car. Also, can that sandpaper get rid of the touchup paint so that I can use the above explain method to fix the scratch?